Obama: "American people stand by the Indonesian people in this difficult time"
(CNN) -- U.S. President Barack Obama and British Foreign Secretary David Miliband both said they "strongly condemn" Friday's deadly hotel attacks in Jakarta, Indonesia. Windows at the Ritz-Carlton are blown out after Friday's blast. The German government also voiced its condemnation as nations began sharing their grief and anger. 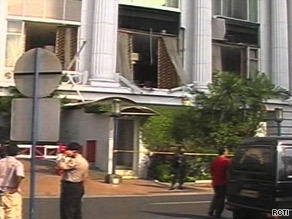 Indonesian authorities believe two suicide bombers checked into the JW Marriott Hotel in Jakarta and carried out coordinated bombings Friday morning, killing at least six people and wounding more than 50. Police said no one has claimed responsibility for the attacks on the Marriott and the adjacent Ritz-Carlton hotel. "I strongly condemn the attacks that occurred this morning in Jakarta, and extend my deepest condolences to all of the victims and their loved ones," Obama said in a written statement. "The American people stand by the Indonesian people in this difficult time, and the U.S. government stands ready to help the Indonesian government respond to and recover from these outrageous attacks as a friend and partner. "Indonesia has been steadfast in combating violent extremism, and has successfully curbed terrorist activity within its borders. However, these attacks make it clear that extremists remain committed to murdering innocent men, women and children of any faith in all countries. "We will continue to partner with Indonesia to eliminate the threat from these violent extremists, and we will be unwavering in supporting a future of security and opportunity for the Indonesian people." Miliband, after also expressing his condemnation and condolences, added, "These attacks remind us, yet again, of the threat people of all races and religion face from violent extremists. Indonesia is the world's largest Muslim democracy. An attack on Indonesia is an attack on all decent people. "The bombings are in marked contrast to the wishes of the millions of Indonesians who voted peacefully in last week's elections. We will continue to work with the government of Indonesia to stop terrorism. Today we stand in solidarity and sorrow." German Foreign Minister Frank-Walter Steinmeier issued a statement saying, "The German Federal Government condemns the cowardly attacks which killed and severely wounded several people this morning in Jakarta. "We share in the grief of the families and friends of the victims and hope the wounded will recovery soon. Those behind these attacks and their supporters must be brought to justice." Both the Marriott International and the Ritz-Carlton Hotel Company issued the same statement. "Immediately following the incident, police and hotel security responded and sealed off the area. Our guests at both properties were evacuated and moved to other nearby hotels. Injured guests and hotel employees were taken to the hospital for treatment. "Both hotels sustained damage, but it does not appear to be structural. At the time of the incident, extensive security procedures were in place at the Ritz-Carlton and the JW Marriott. We continue to work closely with the authorities and hope to reopen the hotels soon. As always, the safety and security of our guests and associates is our top priority."